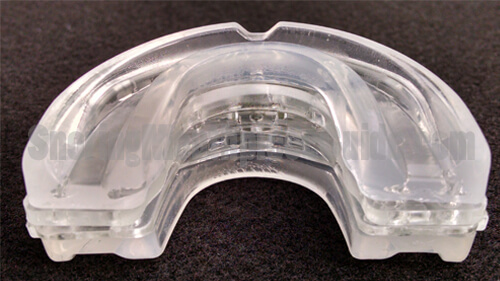 The Eliminator Pro is a self-fitted adjustable mandibular advancement device that offers more features than its predecessor, the Snore Eliminator. While the product packaging contains no company information other than the email address “eliminatorreviews@gmail.com”, after a few minutes of searching I found that it is manufactured and sold by South Carolina based company Koncept Innovators, which is headed by a gentleman by the name of Sylvan Newby. Mr. Newby sells the Eliminator Pro on his website as well as on Amazon under the seller name “Rambuten”. The company sells two identical products called the “Intelliguard” and also the “Tranquility Pro” for a slightly lower price point. In addition to this product, Rambuten also sells other anti-snoring related products including snoring chinstraps, and nasal dilators as well as an assortment of unrelated products such as slingshot stuffed toys, camera accessories, and wire strippers. 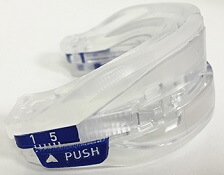 The company also sells a product called the “Snore Pacifier” which is a tongue stabilizing device that is similar in nature to the Good Morning Snore Solution. 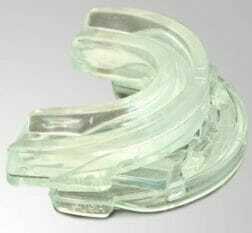 For years now, simple boil and bite mouthpieces that resemble sports mouth guards or night guards have been the standard in self-fitted snoring mouthpieces. 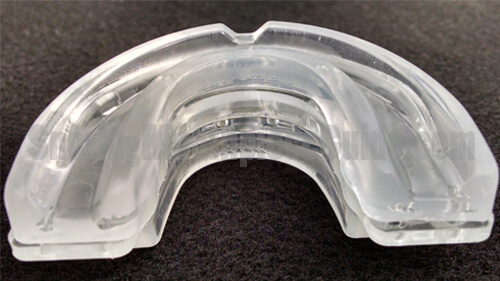 Such products have evolved in recent years to include a number of innovative designs, making wearing a mouth guard more comfortable than ever. The Eliminator Pro sets itself apart from most of the competition by offering an incremental advancement feature that requires no tools to adjust. Adjustments can be made by simply holding the mouthpiece by the top tray, squeezing inward on the rear area of the lower tray and gently rocking the lower tray forward or backward to the desired position. 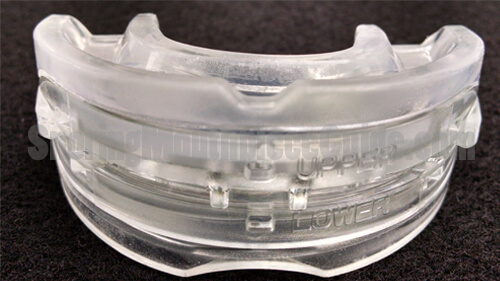 Adjustments can be made multiple times after the mouthpiece has been molded. As with any other mandibular advancement device, the Snore Eliminator Pro is worn inside of the mouth in between the upper and lower teeth. It is placed in the mouth prior to going to sleep. The upper and lower trays work together by holding your jaw slightly forward just enough to allow the lower set of teeth to rest just in front of the upper. The jaw forward action pulls tight loose muscles and tissue that surround the airway. By tightening the airway, you are allowing for the non-restrictive flow of air. What does a clear, non-restricted airway have to do with preventing snoring? Well, quite a bit actually. Numerous studies going back over 30 years suggesting that advancing the jaw forward is an effective means to eliminate snoring and in some cases can effectively manage mild to moderate cases of sleep apnea. 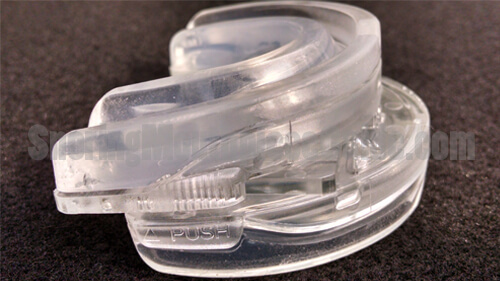 The manufacturer doesn’t, however, make any claims that its product is intended to treat sleep apnea. Prior to 1994, the only way to obtain such a MAD was by visiting your dentist and having it professionally fitted. This option is still available today but will cost you several thousands of dollars. Most of today’s do-it-yourself mouthpieces can be purchased for under $100 on the internet. The manufacturer gives the following instructions that should be used to create a proper fit. The adjustment setting is preset from the factory at the number 3 setting. Ensure that this setting has not changed during shipping. If so, calibrate the mouthpiece by squeezing in on the sides of the lower tray and sliding the upper tray into the position where the indicators on both sides are pointing in between the #1 and #5 position. Boil few cups of water on the stove. Remove the pot from the heat source and pour water into a bowl. Submerge the mouthpiece for exactly 90 seconds. Submerging for a shorter period of time will result in a poor impression while submerging it for too long will distort the plastic and possibly render it unusable. Remove the device from the hot water using a pair of tongs and give it a quick dip in a bath of cool tap water to remove any remaining hot water. Using a mirror, place the device into your mouth. Look into the mirror and ensure that it’s precisely centered in your mouth. Bite down firmly and hold for 30 seconds. Remove the Eliminator Pro from your mouth and submerge in a bowl of cold water for 2 minutes. This will set the impression. If you were unable to obtain a good impression the first time, repeat the above steps once again. In order to make adjustments, the manufacturer suggests simultaneously pushing in on the rear section of the lower tray. This will release the upper tray and allow it to slide forward or backward into the desired position. Is It FDA Cleared and BPA Free? Class II devices are higher risk devices than Class I and require greater regulatory controls to provide reasonable assurance of the device’s safety and effectiveness. A quick search of the FDA database did not show a product listed by the name Snore Eliminator or Intelliguard as a cleared device although, in the Question and Answer section of their Amazon listing, the seller claims that this product is “FDA Clear”. The product packaging does not, however, contain the FDA cleared logo. As for being BPA free, the product packaging or literature contained within does not state whether or not this product contains BPA’s, a chemical used to produce some plastics. There is an ongoing debate over the health risks associated with exposure to BPA’s. 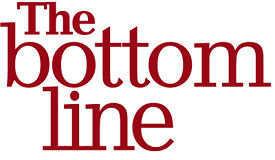 UPDATE: After publishing this review, I was contacted by the manufacturer who has informed me that the Eliminator Pro is, in fact, BPA free. Where is the Snore Eliminator Pro made? I was unable to locate the country of origin label on the mouthpiece that I had received. It’s entirely possible that my device was missed during the labeling process. Also, product packaging and information provided did not reveal the country of origin. Once again, I checked the Q&A section of Amazon and found others who had the same question. The seller states this device is “Made in China“. 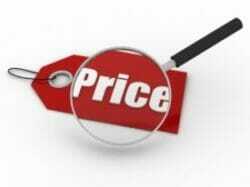 The overall cost of a product is often a deciding factor when it comes to making a buying decision. The Eliminator Pro sells on Amazon for $49.97 with free shipping or the Intelliguard can be purchased for just under $45 including shipping costs. 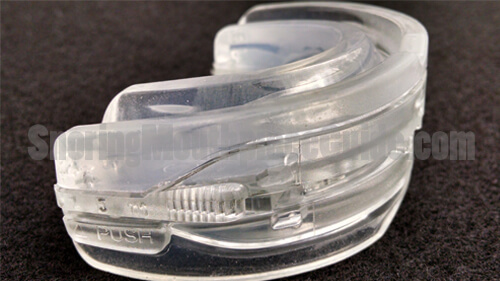 Most snoring mouthpieces sell between $25 and $100. It’s the closest competitor, the SnoreRX, currently retails for $99, making the Eliminator Pro a less expensive choice. The question is, are they equivalently designed and made from similar materials? Snore Eliminator Pro Vs SnoreRx – Are They The Same Product? A common question asked by those interested in this product is whether the Snore Eliminator Pro and Snore RX are the same product. After all, they are both nearly identical in appearance and function in the same fashion. Perhaps the two products are being sold by the same company? 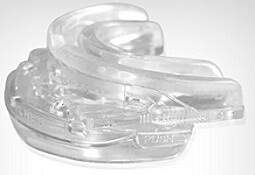 Snore Rx is manufactured and sold by Apnea Science Corporation, based out of Aliso Viejo, California. The company was created by Jim C Fallon (No, not the late night talk show host) and appears to have launched in early 2012. In contrast, the company who manufactures and sells the Snore Eliminator Pro operates out of Myrtle Beach and seemed to have made an appearance in early 2015. On the surface, it doesn’t appear as if the two companies are related. Let’s take a closer look by comparing the actual products. *Note: Measurements are taken prior to fitting. The material of both products will become slightly more compact once heated and fitted. Heigth At Front 1.09" 1.01"
Heigth At Rear .80" .39"
It’s easy to see that while the two products differ, they do share many of the same attributes. The first difference that you may have noticed is the price. The Eliminator Pro retails for half the cost of the SnoreRX. Other differences include the country of origin, FDA clearance status, and materials used. Perhaps the most notable difference is the thickness at the rear of each device. Measuring .39″, the SnoreRx measures half the thickness at the rear compared to the SnoreRx. Other measurements such as the height at the front, overall depth, and the widest point are nearly identical. Also, both products come with a 30-day money back guarantee. As for design, they are both nearly identical with a few slight variations between the two. Both products use a rigid plastic framework with a soft thermoplastic insert lining that attaches to the frame. Both have a ratcheting system that enables you to make micro-adjustments up to 10 mm, in 1 mm increments. One small difference is the SnoreRx has grooves in the upper tray that fit into an adjoining counterpart located on the lower tray. This helps to center the upper and lower trays while making advancement adjustments. This feature is absent in the Eliminator Pro. It’s fairly safe to say that the design of each is nearly the same. In fact, the framework is so similar, you can separate the upper and lower trays of each device and reconnect them to the other! While this product is sold on Amazon as a Bruxism night guard with no mentions of the phrase “snoring”, based on the customer reviews, it’s evident that nearly everyone who has left feedback for this product is using it for the purpose of controlling snoring. Aside from being a bit thicker at the rear of the device, the Eliminator Pro is a less expensive alternative than the $99 SnoreRx. If the extra thickness and lack of FDA clearance are not a concern to you, then, by all means, go with the less expensive alternative. 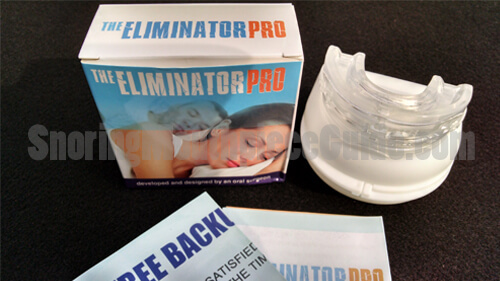 The Eliminator Pro advances the jaw and function just as any other mandibular advancement device does and is effective against snoring. 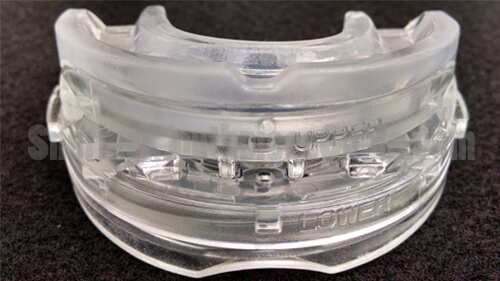 Keep in mind, several different styles of snoring mouthpieces are available. If you are interested, take a look at this comparison table that I created which allows you to compare nearly 30 different devices that are currently being sold. Next post: Review of the Pacifier (PAC 100#) Tongue Retention Breathing Night Sleep Aid – How does it compare to the Good Morning Snore?